Tile installations that are subjected to heavy use are liable, over time, to become loose and the wall behind the tile damaged. If you do not stop and fix it now, the water will damage the framing behind the wall and that is a major headache. The wall tiles near the faucet handles in this picture had started to come loose. If I pushed on the wall, the section at the bottom would move. I started to pry around with a screwdriver and one of the tiles popped off! 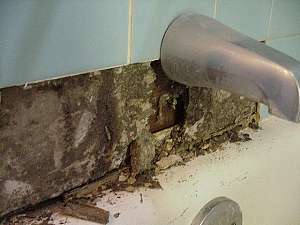 Areas that are most prone to deterioration are around faucets and corners. The majority of these installations are mounted on drywall or "green board." Fortunately, it is possible to remove just the damaged section and replace it. The project takes about 6 hours (depending on damage) and is relatively inexpensive if you reuse existing tiles.